There is nothing more important, individually or corporately.You are light. You are the answer and you beg the question. People will look at you and wonder. They will see the light that you have. In their minds and in their spirits they will ask the question. They will want to know what you have. They will perceive that you are not from the same culture. When Jesus said this He didn’t qualify it. He didn’t say you will become the light of the world when you are good enough. No, you are that light right now. That is what you are not what you are going to be. How brightly you shine is up to you. This light expels the darkness and attracts people. It is the very light of heaven in you. It is the glory of God in you. They will see Him in you and that is how it is meant to be. They will love you because they love Him first. They will hate you because they hate Him first. Let people see and experience the light that is in you. 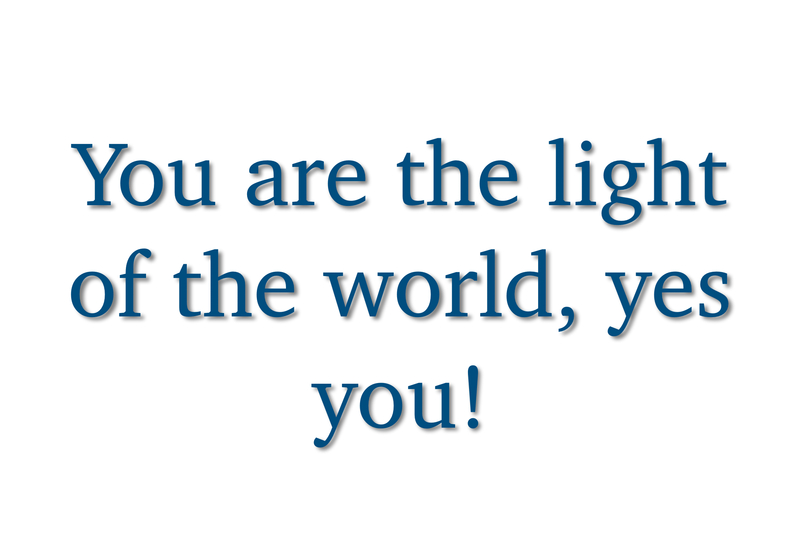 Believe that you are the light to the world. The words you have will bring life. The love that will emanate from you will be His love flowing through you. They want more than mere words. Something they can see as well as hear. You have that within you. The answer, complete and unabridged. You lack nothing because He that lives in you lacks nothing. That is why we can say ‘nothing is impossible’. With confidence we say ‘all things are possible’. Simply because it is not us alone but it is Him in us. The beauty and genius of this is that He is quite happy to use flawed and broken people. If you have made mistakes or messed up you instantly qualify. The light that shines in you is His light. It isn’t a dimmed, weak or ineffective light. It isn’t a broken bulb. It is the light of His glory. It is His kingdom seen. An expression of His love and His joy. It is the light of the good news that He cares passionately about every single person. The world deserves an encounter with Him. There is so much darkness where the enemy has had a field day. destroying people’s lives and relationships. He wants to heal and restore. He is going to do it through you.